From the day of commencement, we are engaged in catering to the variegated requirements of the customers by bringing forth a comprehensive Mechanics Instruments. 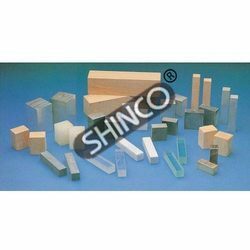 Our entire range of products offered by us is dedicatedly manufactured in strict compliance with the latest technological advancements in the industry to ensure optimum quality in the end product. 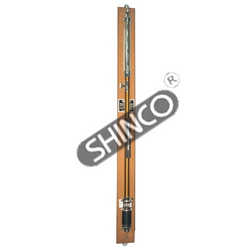 Our product range encompasses Meter Scale, Tubular Spring Scales, Force Table, Pully Single With Three-Way Attachment and several more. 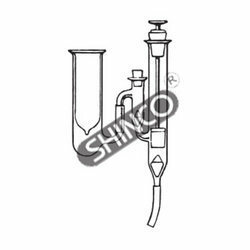 Our organization offers a quality range of Bar Breaking Apparatus to our valuable clients. 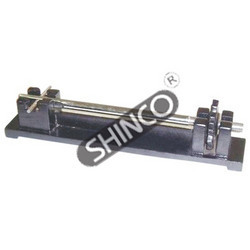 The offered range of products is threaded at one end for large tensioning nut. 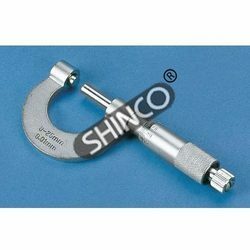 These products also has hole at other end in order to accommodate a cast iron breaking bar and is supplied with 6 breaking bars. 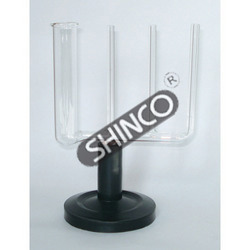 Besides, our bar breaking apparatus is is also available according to the clients demands. 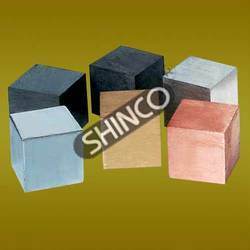 With the help of our sophisticated in-house facilities, we have been able to offer an array of Cubes Of Six Metals Sets. The offered range is manufactured using high quality raw material at our well developed capacious infrastructure unit. Our professionals creatively design this range while keeping in mind the varied requirements of our esteemed customers. 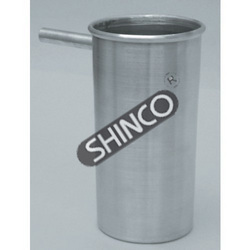 Available in different sizes, our products can also be customized as per the patrons need. 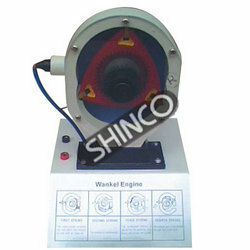 In order to cater to the vast market demands, we are engaged in offering Pully Single With Three-Way Attachment. Ideal for clamping to vertical or horizontal rods and to laboratory tables and boards, our range comprised a specially designed cast bracket that can be clamped on flat surface of 38 mm thick and hold a supporting rod 13mm diameter. We are a leading name in this domain engaged in offering our prestigious patrons Force Table. 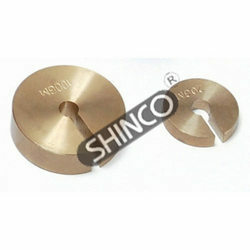 Our range is provided with four weight hangers of 50g each and four sets of brass slotted weights. Each set consists of the masses 2 x 10g, 2 x 20g, 4 x 50g, 4 x 100g, our products are highly acclaimed by our prestigious clients. For slotted masses on rack and 50g hanger. Made of brass with standard slots as supplied on racks. To familiarize the pupils with density, hardness, appearance and texture of common materials. The kit compromises of the following different materials in various sizes. For measuring inertial masses and qualitatively understanding the terms, mass and weight. This principle can be used to determine mass under weightless conditions in space flights. The apparatus consist of two aluminium trays joined together by a pair of spring steel strips attached to their sides. Trays are about 200mm apart. 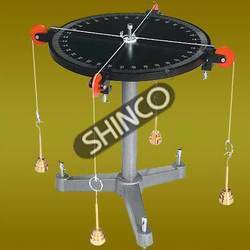 One of the trays (the oscillating tray) is drilled to hold three equal cylindrical masses and the other tray acting as an anchorage is clamped by a C-clamp to a bench. Supplied with three masses and a cord (does not include a C-clamp). 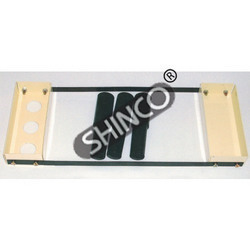 This sturdy carriage has a one piece, high-impact plastic body. The machined aluminum wheels and axles are mounted on hardened steel cone bearings for minimum friction and long life. 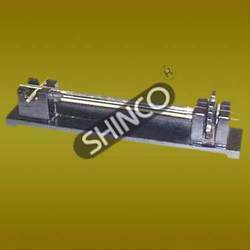 For determination of the coefficient of kinematic and static friction, mechanical advantage and efficiency of an inclined plane etc. 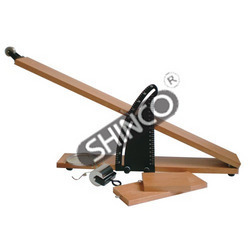 Comprised of a hardwood inclined plane (l x w), 600 x 100mm fitted with a pulley of diameter 22mm at the free end. It is hinged to a horizontal polished wooden base (I x w), 450 x 100mm, which is fitted with an aluminium arc graduated both vertically and angularly. The inclined plane can be fixed at any angle up to 45º or at a suitable height with a clamping wing nut. 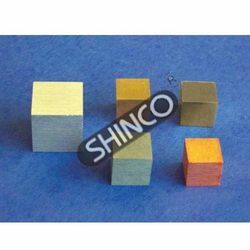 Supplied with a cylindrical plated metal roller, two wooden blocks (I x w), 200 x 75mm and 100 x 75mm, a scale pan diameter 75mm, cord and hook. 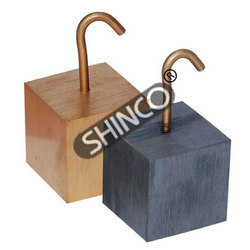 Includes one cube each of aluminium, brass, copper, iron, lead, and zinc without hook. Packed in a cardboard box. For showing that specific gravity depends on the nature of the material being tested. 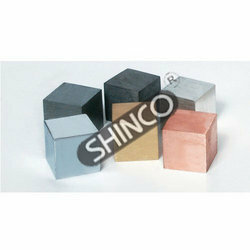 These cubes are carefully machined to 32mm on each side. Provided with a brass hook. To prove the inverse relationship between density and length of cylinders of equal mass and diameter. 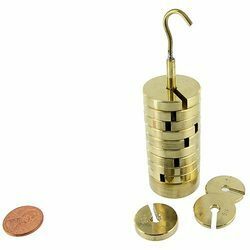 This set consists, of one each of machine turned cylinders of diameter 12.5mm, of equal masses, approx. 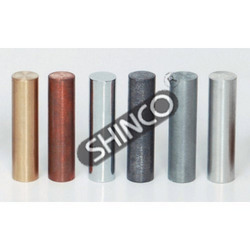 50g, of metals aluminium, lead, copper, brass, and zinc having the same diameter. Packed in a cardboard box. 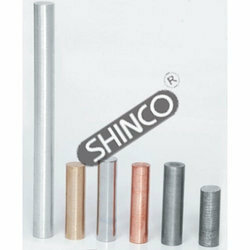 Set of six cylinders of aluminium, brass, copper, iron, lead and zinc. Packed in a cardboard box. 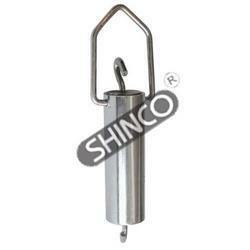 The cylinder measures 75mm long x 25mm diameter with a suspension hook. For determining the volume of an irregularly shaped body when used in conjunction with a catch bucket. 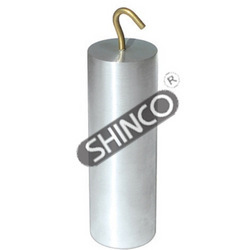 Suitable for density cylinders, sinkers and Archimedes principle devices. Made of Aluminium. The spout is properly angled to accurately measure displaced liquid. Hammer tone finished. 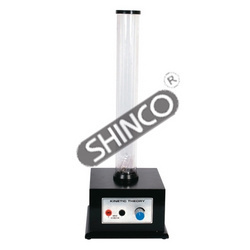 This apparatus gives an excellent visual demonstration of a difficult concept; it shows a qualitative representation of the behavior of a gas as its molecules gain energy. The kinetic theory model also allows the illustration of various aspects of the kinetic theory of gases. For demonstrating that heavy or light objects fall at the same rate in a vacuum. Made of a transparent tube (d x h),100cm x 37mm, with rubber end caps, one of which has a nozzle and stopcock for connecting to a vacuum pump (not included). Provided with a simulated coin and a feather. 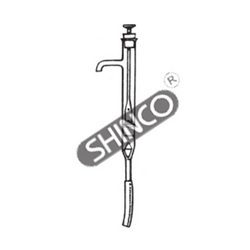 A heavy cast iron frame with slotted end pillar to carry a thick steel bar. 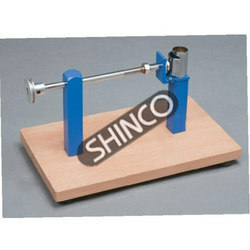 This bar is threaded at one end for large tensioning nut. I also has hole at other end to accommodate a cast iron breaking bar. Supplied with 6 breaking bars. To show that a body launched horizontally will fall vertically at the same rate as a similar freely falling body. 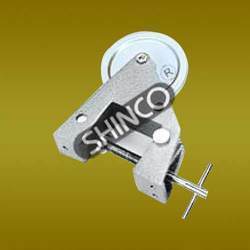 Consists of a push button activated spring-loaded launcher with holes for two steel balls 19mm diameter acting as projectiles. Mounted on a wooden block (I x w x h),180 x 60 X 30mm. Designed to project one ball forward and the other to fall freely. 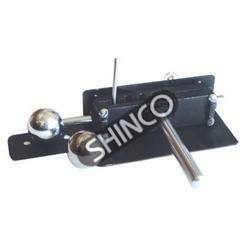 Consists of spring-loaded metal device and two steel balls. Demonstrates that a ball released vertically will hit the floor at the same speed of a ball released horizontally. For the dramatic and puzzling visualization of the effect of change of centre of gravity of an object. 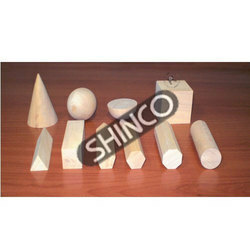 Consists of a pair of wooden double ended cones, a wooden diverging bar 0 to 10cm wide, serving as an inclined plane. When the double cone is set on the bars of the inclined plane the cone appears to roll up the plane violating the law of gravity. This is possible because the axis of the cone is actually moving downward due to a widening of the track. These solids demonstrate the relationships between volume, size and shape. This set contains 10 pieces which are made of wood. To show the conversion of potential energy stored in the twisted bands of rubber into electrical energy. This unit demonstrates the conversion of electrical energy to heat via friction on the outside of a rotating vessel. For use as a water turbine to drive a generator or for use as pump driven by a motor and raising a head of water to produce potential energy. 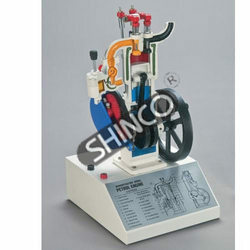 Two inlet tubes (for turbine and pump operation) and one outlet tubule are provided. A shaft is attached to the turbine and drives a 15mm pulley. Lift pump with glass valves un-mounted. 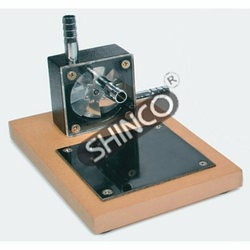 For inside, outside, step and depth measurement. 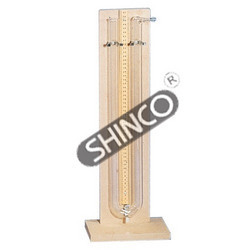 Has metric scale to 15cm in 1mm steps and the 10 part vernier reads to 0.1mm least count. English scale is graduated to 6in in 1/16in divisions and the 8 part vernier reads to 1/128in least count. Verniers are adjustable and can be trued, if desired. Automatic cam locking device allows fine adjustment along the main scale. Made of plated steel and packed in plastic case. 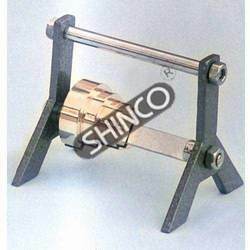 For measurement of small outside diameter, thickness etc. 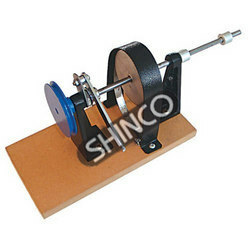 Ideal for engineering and technical schools to teach the working of this instrument. 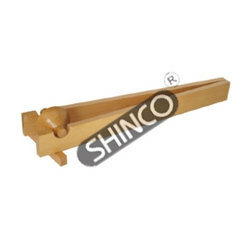 Consists of a frame of solid brass body with a chrome satin finish and a hardened steel screw. Provided with a ratchet and a locknut for accurate readings. Zero adjustment is possible. Pitch of the screw is 0.5mm and the least count is 0.01mm. 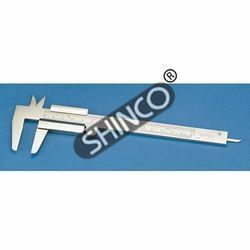 Micrometers with English scale has pitch of 0.05in and the least count of 0.001in. Packed in a plastic case. For measuring the pressure of gases. Suitable for moderate pressures. 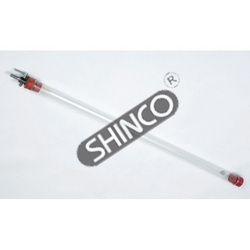 Consists of a borosilicate glass U-tube, diameter 25mm and 50cm high, open at both ends. Has one riffled arm for easy connection to rubber tubing. Mounted on a wooden board fixed on a metal stand. A metric scale is fitted between the arms of the tube. It is recommended to use colored water for greater visibility in a lecture hall. This unit demonstrates the principle of operation of the Wankel engine with its circulating piston. It is cutaway to show the internal construction details. Mounted on a base. Same as above but with chain drive from crank shaft for cam operated inlet and exhaust valve. blowing, mounted on heavy metal base. 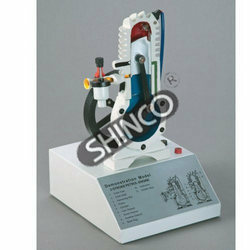 Hydraulic press with glass valves un-mounted.